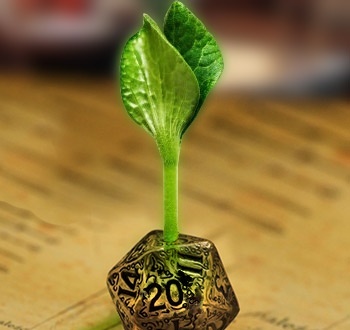 You might play them in different ways, but under the surface, tabletop RPGs and videogames have plenty in common. D&D and all subsequent tabletop games have roots in war simulation ... In Lake Geneva, Wisconsin, one group's familiarity with war games and a fascination with the fantasy stories of Jack Vance and Robert E. Howard (Conan) eventually became Dungeons & Dragons. Modern videogames also have roots in war simulation, if a more fanciful sort ... Being science-fiction geeks, [Spacewar! creator Steve] Russell and his team decided to simulate a space battle, complete with inertial physics, a central gravity well in the play field, and two armed spaceships. The idea caught on, inspired copycats, and ignited the game industry. To see the impact of common heritage between videogames and tabletop games, consider Darwin's finches: a common ancestry that branched in different environments. Darwin observed that, although finches inhabited all the Galapagos islands, the finches on each island were distinct species. He theorized that their modern differences rise because they occupy the same niche in separate environments. Videogames and tabletop games have also developed on what amounts to different islands. Videogames developed to run by CPU, whereas tabletop games were run by people. Speciation makes each kind of simulation different, because each environment has different resources. Niese also notes that unlike most evolving species, videogames and RPGs have had numerous opportunities to intermingle over the years, and the hybrid offspring has taken the evolution of the main species in new and interesting directions. You can read more about it in his article "On the Origin of Games."